Fiscal Year 2018 concluded on June 30, 2018 for the State of Maryland, and during the last Fiscal Year, the staff of the MDVA Service & Benefits program submitted 4,827 claims for Maryland Veterans and dependents to the United States Department of Veterans Affairs. Monetary payments for approved claims during the year totaled $29,883,069 paid to Maryland Veterans and dependents. Governor Larry Hogan, Lt. 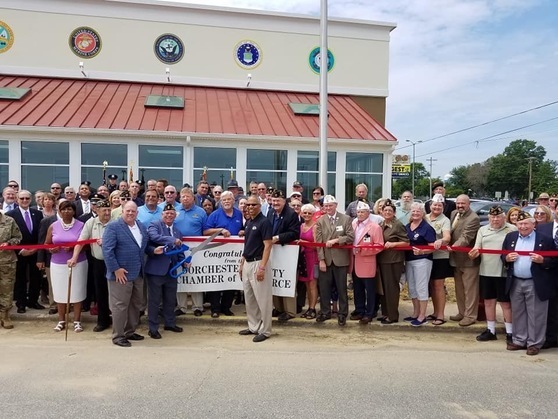 Governor Boyd Rutherford, MDVA Secretary George Owings, American Legion Leadership and Members, Chamber of Commerce Members as well as the Public, all celebrated the Dedication and Re-Opening of American Legion Post 91 in Cambridge on Tuesday, July 18th. Post 91 was damaged by fire in May 2016. 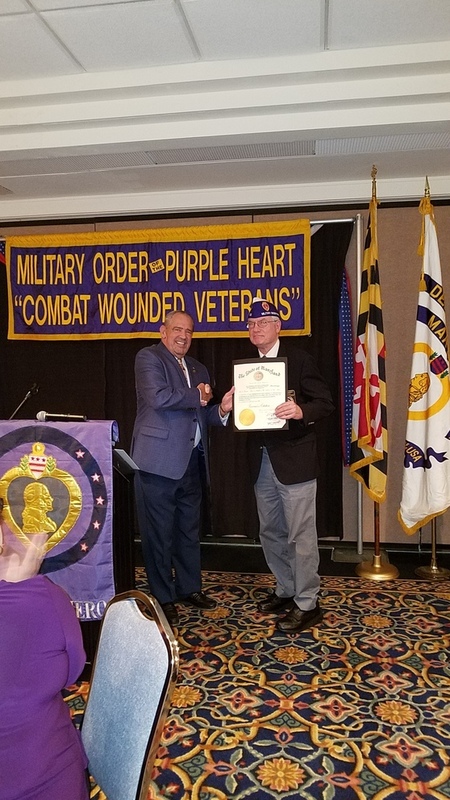 MDVA Secretary George Owings attended the Military Order of the Purple Heart Department of Maryland State Convention, and presented Outgoing Commander Les Chambers with a Citation from Governor Hogan, recognizing Commander Chambers' dedicated service to the organization. Secretary Owings also spoke at the recent American Legion Convention. Shown in this photo from right to left are: MDVA Secretary George Owings, Carol Lewis, Director of Marketing at Charlotte Hall Veterans Home and Tom Anderson, Commander of American Legion Post 91 in Cambridge. The Maryland Department of Commerce announced that five veteran-owned businesses have received a total of $250,000 in financing through the Military Personnel and Veteran-Owned Small Business No-Interest Loan Program (MPVSBLP), which will help create nearly 40 new jobs throughout the state. Each business will use the $50,000 loan to support expansions and job creation, as well as infrastructure upgrades, equipment purchases, and working capital. The businesses receiving financial assistance include C&B Strategic Consulting, Inc., a Baltimore-based firm specializing in information technology and program management; C&E Pharmacy Services LLC, an Annapolis pharmaceutical startup specializing in virtual pharmacy services for veterans; Grimmer Technology and Operations Inc., a Howard County IT company that supports federal contracts for the Department of Defense; Narrows Hill LLC, a tabletop games and accessories developer based in Garrett County; and Spin Juice House, a startup retail juice and health food café in Waldorf. The Military Personnel and Veteran-Owned Small Business No-Interest Loan Program was created in 2006 and is administered by Commerce in consultation with the Maryland Department of Veteran Affairs. Veterans, military reservists, and National Guard members who own a business are eligible to apply. The program also accepts applications from small businesses that employ military reservists and National Guard members called to active duty, as well as companies owned by or employing service-disabled veterans. Applications for the state’s veteran loan program are currently being accepted through August 17, 2018. To learn more about the program, please visit our website. The FTC, along with Attorneys General and charity regulators from 70 offices in every state, the District of Columbia, American Samoa, Guam, and Puerto Rico, announced more than 100 actions against fraudulent charities that con consumers by falsely promising their donations will help veterans and servicemembers. In the state actions announced today, charities and fundraisers sought donations online and via telemarketing, direct mail, door-to-door contacts, and at retail stores, falsely promising to help homeless and disabled veterans, to provide veterans with employment counseling, mental health counseling or other assistance, and to send care packages to deployed service members. "Sham charities steal from consumers," said Attorney General Frosh. "They rely on our noble instincts - to help veterans and other worthy causes - but they use the money they collect to enrich themselves. They hurt legitimate charitable organizations by siphoning off support from their good work. We are committed to putting these fraudsters out of business." The Maryland State Department of Assessments and Taxation (SDAT) is urging Marylanders to consider whether they may be eligible to receive a homeowners’ or renters’ property tax credit and to submit an application before the September 1 deadline. As part of this awareness campaign, this week SDAT mailed 77,544 postcards to low-income Maryland homeowners who may be eligible to receive a credit, but have not yet submitted an application. SDAT representatives have consistently participated in various community outreach events throughout the year hosted by senior centers, neighborhood alliances, and non-profit organizations to educate Marylanders about tax relief that may be available to them. To determine whether you are eligible to receive a tax credit, you may visit the links above or call 410-767-4433 or 1-800-944-7403 (toll free within Maryland). To receive an application, please email sdat.taxcreditapp@maryland.gov or call 410-767-4238. These credits must be applied for annually by September 1. In 2017, approximately 47,000 homeowners received an average of $1,339 in tax relief, while more than 8,800 renters received an average of $402 in tax relief. Combined, these two tax credit programs saved Maryland taxpayers more than $65 million last year. After the 2017 Tax Credit Awareness Campaign, an additional 10,000 Maryland homeowners and renters applied for a tax credit. Many counties and municipalities also provide supplemental credits, which provide additional tax relief. If a resident is approved to receive the state credit, they will automatically receive any local supplemental credit for which they are eligible. In order to educate Maryland homeowners and renters about the availability of these tax credits, SDAT has been proactively sharing this information with the public through direct mail, email campaigns, social media, and other forms of community outreach. Students across the nation are digging through archives, visiting their local cemeteries, and sharing stories of resilience and strength as a result of the Veterans Legacy Program. This National Cemetery Administration program challenges the younger generation to learn more about our Nation's Veterans while providing them with tools to uncover Veterans' stories. See what they have discovered. 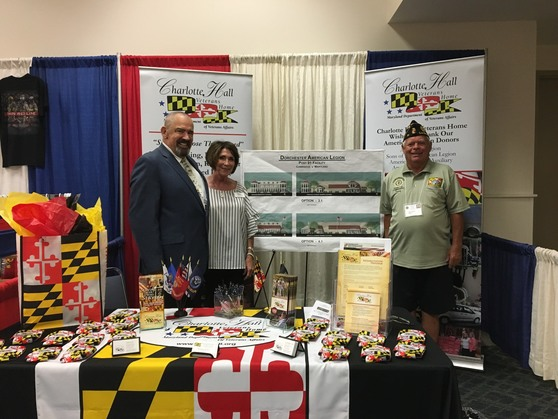 American Legion Synepuxent Post #166 American Legion and the Vietnam Veterans of America Chapter #1091 will hold an OPEN HOUSE on Friday July 27th at the Post home located at 2308 Philadelphia Avenue, Ocean City, MD. This is to recognize the 65th Anniversary of the Cease Fire of the Korean War. All area Korean War ERA Veterans are welcome to attend this OPEN HOUSE between 1300hrs and 1600hrs. Operation Tohidu® is a free, 5-day retreat program provided by Melwood Veterans Services. It is for veterans or service members that have been diagnosed with or are self-identifying with post-traumatic stress, traumatic brain injury or other service-related issues. The Global Good Fund Veteran Leadership Development Program supports veteran entrepreneurs who are striving to make a significant positive change to social issues, including those within the veteran community. Our 12-month program provides leadership skills feedback through a specifically designed Mirror 360 Review, leadership development coaching, executive mentors, and $10,000 to support personal leadership development. The program is provided almost entirely virtually allowing us to support veteran entrepreneurs across the United States. The 2019 Global Good Fund Veteran Entrepreneur Leadership Development application consists of a two-phase process. Phase I online application questionnaire is available June 1, 2018 through August 31, 2018. Phase II is by invitation only and consists of a personal interview. All applicants will be notified via email of their application status.